Super light and strong chain. Highly recommended. Durable chains for a great price. I've used KMC on my last bike and did not need to change after 11 months. I sold the bike during that time and the chain had not stretched. I ride 700 - 800 miles per month and it was still going strong! I'll never use Shimano chains again. The best chain on the market. Super light and durable. Third KMC chain for me - light & strong. Great Price, great service, speedy delivery. KMC chains are good value and seem to last longer than shimano chains. My first KMC chain and seems to be quiet and smooth. Not sure about longevity yet, only used Campy chains in the past and thought I'd give these a go for a change. Love these chains!! Works well with my shimano and Sram 11 speed setup!! I recommend this product. KMC chains are the best for weight, reliability, quietness, value. Merlin always offers competitive prices and quick delivery. Superb chain; I always buy KMC-SL chains & they are worth every penny. I keep using these chains on all my bikes - they last for ages before chain check tool indicates replacement necessary - great value for money. Always go for KMC chains and this chain like the ones before doesn't give me any reason to change. If you're looking for a replacement chain for your Campagnolo drives, you've found it. And even better than the original one! I have installed one of those in one of my bikes and 1500 km later, it seems like I did it yesterday. My chain checker even can't mark any wear (< 0.25% elongation). For my Drivetrains I'll use only KMC chains now. Small amount of chain noise, but I suspect it needs to break in for a 100km or so. Well built. Lighter and cheaper than Campagnolo's own 11 speed chain and works faultlessly... No complaints!! 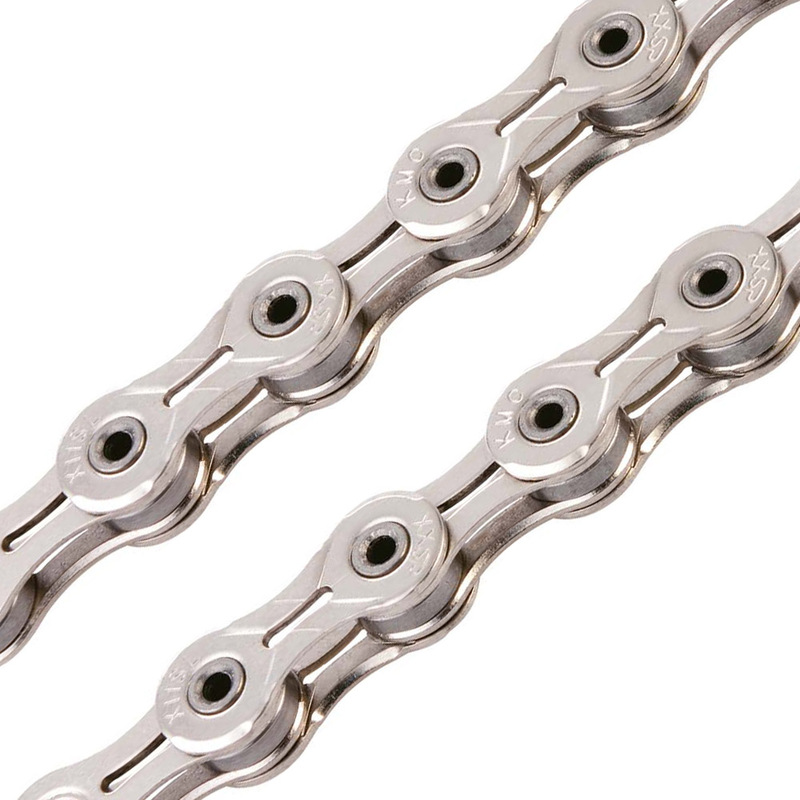 Great value, KMC chains very reliable, light chain, great shifting. Just replaced my Campy Record chain with the KMC SL. Seems to me that KMC make the better chain - it's noticeably smoother and I would recommend it as a replacement for any Campy 11 speed. Much easier to fit with the split link and no expensive Campy tool required! KMC currently make the best chains going, just fitted this with a new Dura ace 11 speed drive train, and so much sweeter than the Shimano chain that came with the groupset.